The iHostPBX within Q-Suite is a complete GUI to setup, manage and run your phone system. Built upon Asterisk PBX, it can handle your requirements, whether you are a small or large premise based organization looking for a stable sophisticated phone switch or a service provider offering multi-tenant hosted service. A key ingredient to any good phone system regardless of your industry domain or size, has to be able to grow, adapt, and change with the increasing demands and requirements. The iHostPBX not only meets those demands head on but will exceed them by provide your organization with the savings, flexibility and freedom to take them to the next level. Asterisk based iHostPBX offers features and services which are difficult to get from traditional phone service. Businesses can effectively use their web-based portal to access and manage any of the extensive features offered by the iHostPBX in minutes at no additional cost compared to the hours or even days and high costs it would take with traditional PBXs or phone service providers. The multi-tenant architecture for the PBX setup is meant to handle all the requirements of a hosted service provider. It is a true multi-tenant PBX with an web portal to manage all facets of setting up your service to provide multi-tenant PBX. With focus on scalability and redundancy, you can expect to see a system that can grow to multiple Asterisk servers and meet your growing demands. The web-based tenant management portal provides an easy to use unified interface. Indosoft iHostPBX comes with a feature rich native Windows session controller that can be deployed for both extensions and reception. It comes with multi-language support and has a fully functional interface for the reception to manage the switchboard. 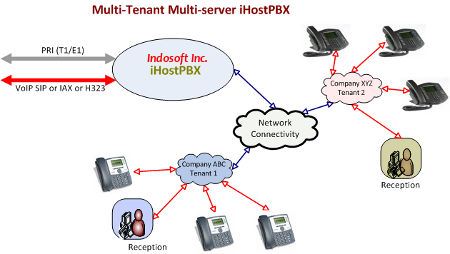 Indosoft iHostPBX is a comprehensive multi-tenant PBX based on Asterisk. It comes with a unified web portal to manage all facets of the PBX, whether it is a large organization, a multi-office setup or a full fledged hosted service provider. It also comes with a Windows based native client session controller which can be installed in every desk or just the reception. 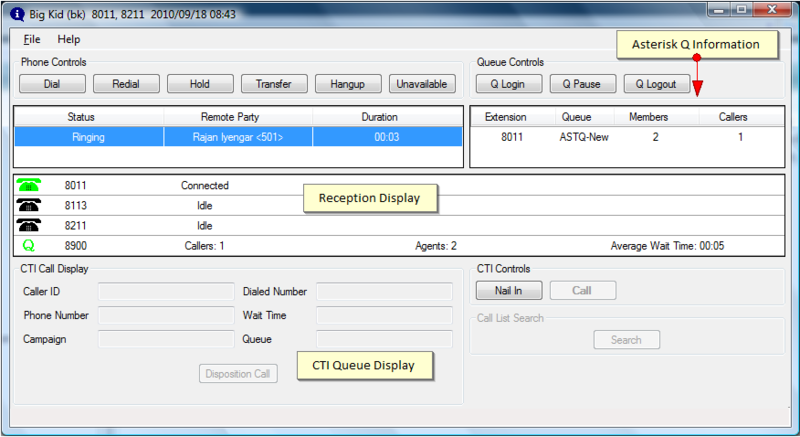 The reception can have a fully functional view of the switchboard and perform all the PBX reception activities. The system can effortlessly scale to multiple Asterisk servers and allow you to expand your capacity. Being s multi-tenant system, the web portal comes with multiple levels of access to the iHostPBX. Indosoft iHostPBX offers an impressive range of features, enhancing the efficiency of your business. These features are particularly remarkable in such an affordable product and they come right out of the box. This dialer can scale to accommodate your requirements and deliver good talk-time for the agents. Manage a global pool of trunks, DIDs, etc. iHostPBX is a feature rich, versatile multi-tenant PBX, which leverages all the advantages of VoIP and TDM. Whether you are looking for a customer premise PBX or planning to setup a hosted multi-tenant PBX, iHostPBX offers your organization the ability to setup, create, manage and administer a scalable hybrid VoIP enabled PBX based on Asterisk, the most powerful and flexible open source PBX. More importantly, it can scale to multiple Asterisk telephony servers whether they are in one location or multiple locations. This can address the requirements of small but distributed companies as well as very large corporations. With a powerful User Portal to manage and customize features like voice-mail, voicemail to e-mail, DND, call recording, call history and call forwarding, it gives the end-user complete control of their phone usage. Access and creation of custom feature/star codes. Scaling is an important consideration when the number of extensions grow. Whether it is a multi-tenant system or a customer premise install for a large organization, you may exceed the call capacity offered by the Asterisk installation on a single server. iHostPBX will allow you to effortlessly grow to multiple Asterisk server and manage a multiple Asterisk setup under one iHostPBX. This is a powerful interface available to each extension that will allow them to view the calls and perform actions like hold, transfer and dial. It provides details of call waiting and a directory to which extension can transfer calls. This display can be expanded for a Reception Desk with drag and drop features for call transfers. There are two distinct options for ACD. You can choose to enable the Asterisk Queue features and its inherent ACD capabilities or you choose to enable the call center ACD that comes with Q-Suite ACD. Q-Suite ACD can provide you the most sophisticated ACD features to go with your office phone system. In large offices it may be necessary to have both the PBX and the ACD co-exist seamlessly.